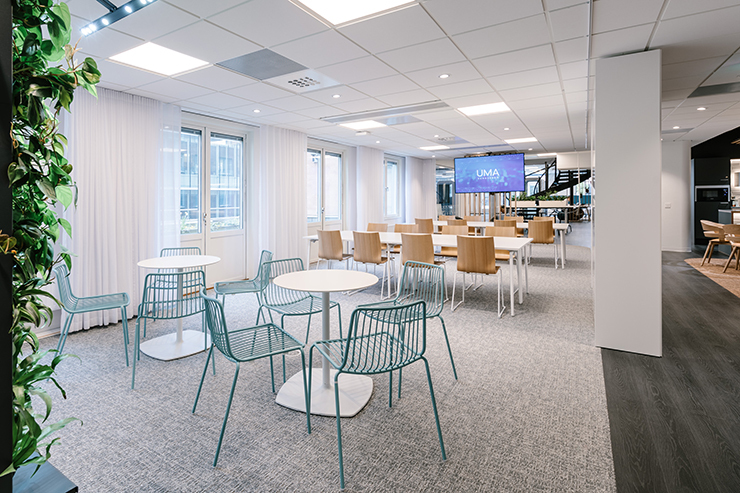 Last spring Technopolis opened a new UMA Coworking space in the heart of Stockholm. In September, UMA Vestergade was opened in Copenhagen, and at the end of this year, the network will expand to Oslo and to the Kalasatama district in Helsinki. Private offices, meeting rooms, shared workstations and versatile services are all available in this working environment that suits both small companies and large enterprises’ mobile workforce, as well as start-ups that appreciate easily adjustable premises. 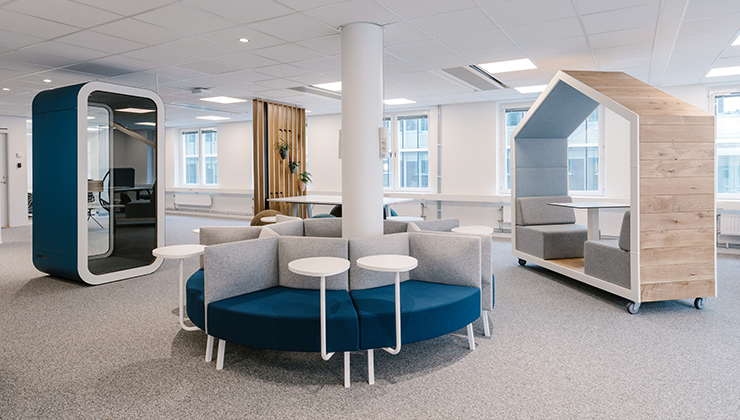 Created in cooperation with Gullstén-Inkinen, this office concept combines flexibility to comfort and Nordic design. Coworking environments are rapidly becoming more and more popular. UMA is short for Human Workspace. It is a network of coworking spaces created by Technopolis, and it’s growing fast. The flagship UMA Esplanadi was opened in the centre of Helsinki, upstairs of the Academic Bookstore, in 2016. Due to great demand, this complex has already been enlarged. Before the end of 2020, Technopolis aims to open 20 new UMA spaces in the largest cities of the Nordic countries and the Baltic Sea region. Coworking spaces are a trend that is growing fast. Technopolis thinks this is due to more agile business solutions that companies need in order to succeed. At the same time, they need to attract the most talented employees, which increases the importance of top-class premises in a central location. 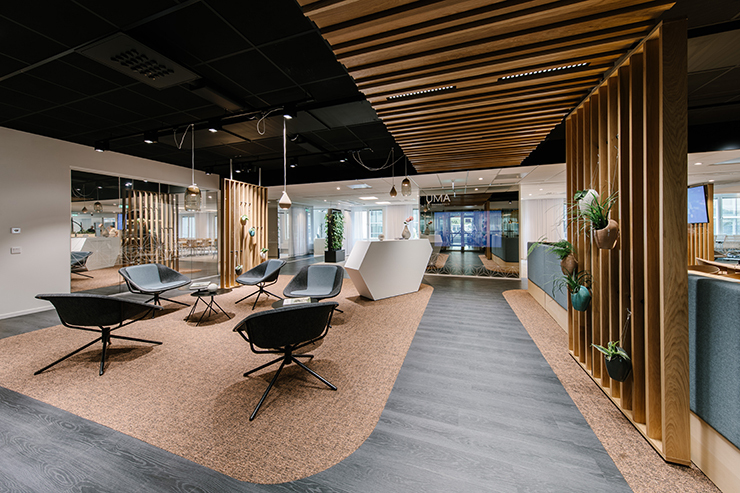 Location is everything in the UMA Workspace concept. Like UMA Esplanadi in Helsinki, the new UMA Kungsbron in Stockholm, opened last April, is very centrally located, it’s just next to the Cityterminal and Arlanda Express station. This first UMA of Stockholm is 2,350 square meters in size. It includes 53 small offices, 90 shared workstations and seven meeting rooms. Opened in September, UMA Vestergade, the first UMA of Copenhagen, is also located in the city centre, next to the main shopping street Strøget and the City Hall. In December 2018, two more UMAs will be opened: UMA Oslo City in downtown Oslo and UMA Teurastamo, in the growing district of Kalasatama, Helsinki. 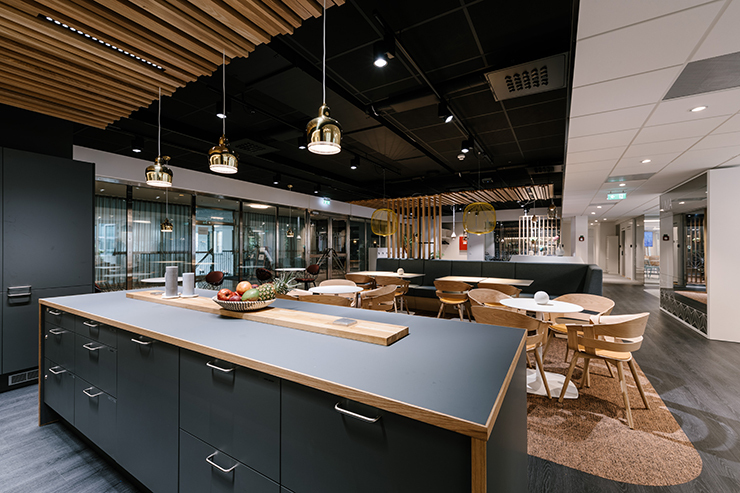 Gullstén-Inkinen has designed the UMA Workspaces in Helsinki, Stockholm, Copenhagen and Oslo. 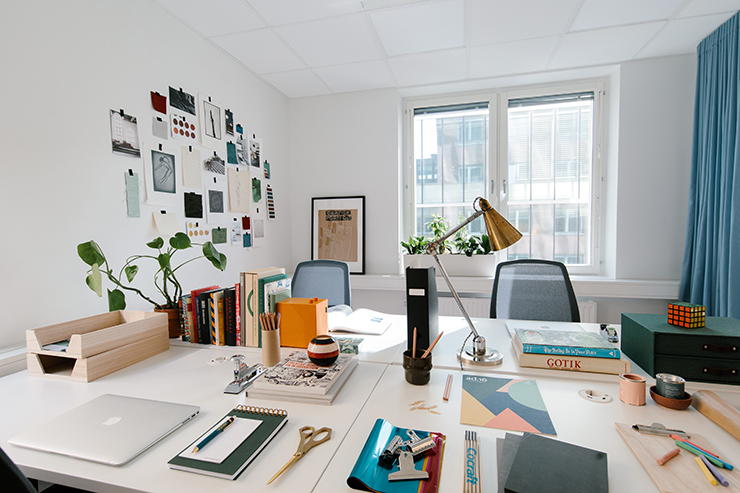 “The idea was to create an adjustable and clearly recognizable space concept that flexibly suits many different ways of working while also representing Nordic design,” says interior architect Mira Hölttä of Gullstén-Inkinen. Each project takes into account the spirit of the original building. In each UMA Workspace, the reception lobby is made attractive and welcoming following the UMA concept. “UMA Kungsbron in Stockholm features large windows that many people pass on their daily commute. We want the entrance to look interesting and inviting and to say that there’s a lot going on inside,” says Mira Hölttä. The lobby has been divided into two separate areas by copper carpeting. There’s an aisle in the middle that leads further inside towards the reception desk and the information screens on a mirror wall. The ceiling is black with a wood grating to create a homely look and visually tie the lobby together. The premises have been designed so that their functions apply to companies of various sizes and different ways of working. Employees telecommuting to large companies can use the workspaces to expand their offices and utilize the meeting rooms of various sizes. Small companies can lease furnished offices for 4 to 6 persons for their own use. The open working community is an essential part of the UMA concept. 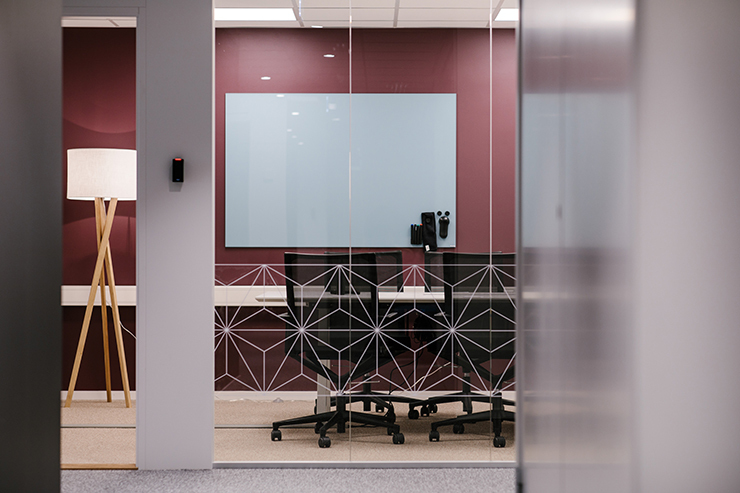 Each UMA workspace also includes branded space concepts. UMA Coffee is an open lounge where members can enjoy high-quality coffee while working and exchanging ideas. UMA Event Venue is designed for organizing events. The UMA membership includes weekly breakfast and after-work events. The guiding principle of the concept is to help people focus on their work while enjoying the surrounding community. The popularity of coworking spaces indicates a larger change in work culture and ways of working. “Work culture is clearly becoming more open and social. Instead of a basic office space, people now want others in the same space to be able to exchange ideas during work. First and foremost, work space is now approached from the employee’s point of view. Office interiors are moving towards a more homely direction, too. Natural materials are preferred because they are attractive to people and create a pleasant atmosphere. Subconsciously they transmit the feel of nature and forest and therefore have a calming effect,” Mira Hölttä concludes.